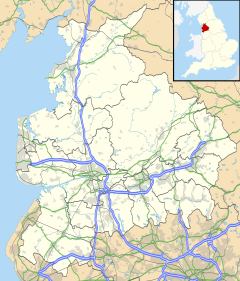 Fulwood is an affluent township in Lancashire, England, forming much of the northern half of the unparished area of the City of Preston district. It had a population of 33,171 in 2001. For several reasons, despite its close proximity to Preston, it has remained distinctly separated. 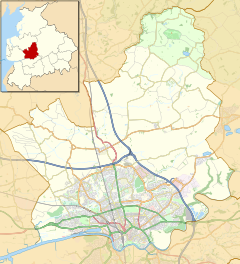 Historically, Fulwood was governed independently from Preston until 1974. Furthermore, since the majority of the area is encompassed under The Fulwood Conservation Area, it has remained geographically separate from Preston. Fulwood, in 2011, had a population of 28,353 and is made up of five wards. Fulwood has expanded in the 20th century, and has been popular with housing and business developers, with its close links to the M6 and M55 motorways. Since the 1970s when the Central Lancashire New Town was proposed, large sites have been made available for development, such as Longsands, which is a residential area, and "East Preston", where many businesses are currently located, including the Lancashire Evening Post (LEP), Asda, Royal Mail sorting office, Independent Inspections, Xchanging, CPC, EDS and Holiday Inn. The B6241 (Eastway) provides a vital route, bypassing much of the residential and central areas of Preston, and a road via Longsands connects it to the M6 motorway (at junction 31A which was opened in the 1990s) and the Bluebell Way business park on the boundary with Brookfield. It is also the home of the Royal Preston Hospital, Sharoe Green Hospital was also in Fulwood until its closure in 2004. Fulwood Barracks has been the home of the Queen's Lancashire Regiment, and other regiments, and is the site of the Queen's Lancashire Regiment Museum. A notable former resident was Major John Rouse Merriott Chard, of the Royal Engineers, V.C., officer commanding at Rorke's Drift in 1879. He was posted to Preston between 1887 and 1892, and is recorded in the 1891 Census living at 80 Victoria Road, Fulwood. Since the mass migration of Indians, Fulwood has been a popular place of residence for well-known, and wealthy families of the Vora Patel community, many of whom have resided here for several generations. Many families of this community amassed great wealths during the economic prosperity of the textiles industry in Northern England and, to this day, retain much of their wealth and have bought many of Lancashire's historic properties. Fulwood is one of the greener parts of the Preston area, however it is nevertheless a fairly built up area, with buildings dating back to the Victorian gentrification of the region, and earlier. Due to large investments during the late Victorian era, Fulwood was an area of much development by wealthy Preston industrialists. Some of the finest Victorian buildings of Lancashire can be found in Fulwood, such as the Fulwood Barracks, Fulwood Union Workhouse, and Harris Orphanage. Many of the larger houses in Fulwood were also built during the Victorian period, particularly those in the Nooklands cul-de-sac. Fulwood has a large number of local amenities. The neighbourhood has a large number of local shops, primary and high schools, pubs, libraries, a large Asda supermarket and Booths supermarket, Preston's main hospital, a college, parks, and many other services. The town has seven different greens, consisting of Conway Drive, South Drive, Mill Lane, Sherwood, Levensgarth Avenue, Tower Lane and Andertons Way. This makes Fulwood one of the greener districts of Preston. State education is administered by Lancashire County Council. The main campus of Preston's College is located in Fulwood on St Vincent's Road. The electoral wards which make up the area of Fulwood are; Sharoe Green, College, Cadley, Greyfriars and Garrison. Parts of the rural wards, named as Preston Rural East and Preston Rural North, were in the former Preston Rural District. Preston Council meetings are hosted every 3 months classified as Area Forum Meetings, of which Fulwood is the Northern Area Forum. Fylde - elements of Preston Rural North and West. Following their review of parliamentary representation in Lancashire, the Boundary Commission have moved the whole of Fulwood into a new constituency of Wyre and Preston North. Between 1894 and 1974 Fulwood was governed by Fulwood Urban District council which was merged with other districts under the Local Government Act 1972 to become the new non-metropolitan district of the Borough (now City) of Preston. The local cricket teams are Grasshoppers CC (Social Side) and Fulwood & Broughton CC who play in the Palace Shield. In 2005 they[who?] were the most successful cricket side at club level in Britain, winning nine trophies between the senior and junior teams. The local football team is Fulwood Amateurs F.C. who play in the West Lancashire League. The local rugby team is Preston Grasshoppers R.F.C. who play in the national league structure. Fulwood Leisure Centre is on Black Bull Lane. Fulwood railway station was once in Gamull Lane, on the border between Fulwood and Ribbleton, on the Longridge Branch Line. It was renamed Ribbleton railway station in 1900 and closed in 1930. Fulwood is served by several bus routes operated by Preston Bus, Stagecoach in Lancashire and Stagecoach in Lancaster. These services include routes (Preston Bus) 19, 23 & 88 and (Stagecoach) 4, 4C & 40/41 services. There are cycle paths from Fulwood through Lancaster to Carnforth as well, and people are encouraged to use them. ^ "Fulwood Conservation Area Appraisal". Archived from the original on 29 October 2013. Retrieved 22 October 2016. ^ 'The parish of Lancaster: Fulwood', A History of the County of Lancaster: Volume 7 (1912), pp. 137-138. Wikimedia Commons has media related to Fulwood, Lancashire. This page was last edited on 25 September 2018, at 14:15 (UTC).